Specifications: Please check your measurements to make sure the item fits before ordering. Use similar clothing to compare with the size. S: Shoulder: 18.0" -- Sleeve: 25.2" -- Chest: 42.1" -- Waist: 37.4" -- Center Back Length: 28.1" M: Shoulder: 18.5" -- Sleeve: 25.6" -- Chest: 44.1" -- Waist: 39.4" -- Center Back Length: 28.7" L: Shoulder: 19.0" -- Sleeve: 26.0" -- Chest: 46.1"-- Waist: 41.3" -- Center Back Length: 29.3" XL: Shoulder: 19.5" -- Sleeve: 26.4" -- Chest: 48.0" -- Waist: 43.3" -- Center Back Length: 29.9" XXL: Shoulder: 20.0" -- Sleeve: 26.6" -- Chest: 50.0" -- Waist: 45.3" -- Center Back Length: 30.1"
Solid blazer with single-breasted three buttons closure featuring two front pockets at sides, Contrast Color in back neck. Casual style is easily matched with your t-shirt and pants. Lightweight cotton fabric, simple and elegant solid design, military style, stay comfortable but looks cool. Care instructions:After washing or wetting should be timely dry. Drip flat drying in the shade. (S): Shoulder: 42cm/16.5", Chest 100cm/39.3", Waist 94cm/36.9", Sleeve 77cm/30.2", Length 72cm/28.3". (M): Shoulder: 44cm/17.2", Chest 110cm/43.2", Waist 100cm/39.3", Sleeve 82cm/32", Length 76cm/29.8". (L): Shoulder: 48cm/18.8", Chest 114cm/44.8", Waist 106cm/41.6", Sleeve 86cm/33.8", Length 80cm/31.4". (XL): Shoulder: 51cm/20", Chest 125cm/49", Waist 116cm/45.5", Sleeve 94cm/36.9", Length 87cm/34". Sleeves: Start at the center back of your neck and across the shoulder and down to the wrist.Round up to the next even number. 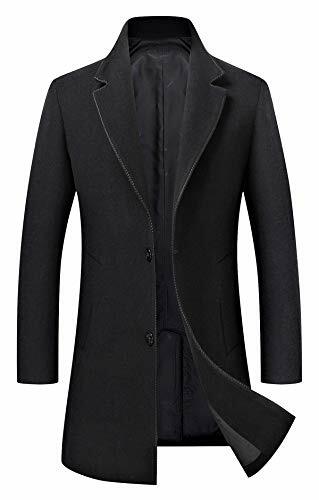 Outfit and Occasions: Style Overcoat (M length:33) , suggest dress shirt, sweater, suit, vest for upper body, normal trousers, jeans for lower body. Easy to find your own mix, simple, stylish, anytime and anywhere. Three-Dimensional Cutting: Customized by professional designer according to European and American body shape, more suitable for these people. We are more concerned about the customer's concerns, there is no problem of pilling, shrinking, pilling, odor, allergies, etc. 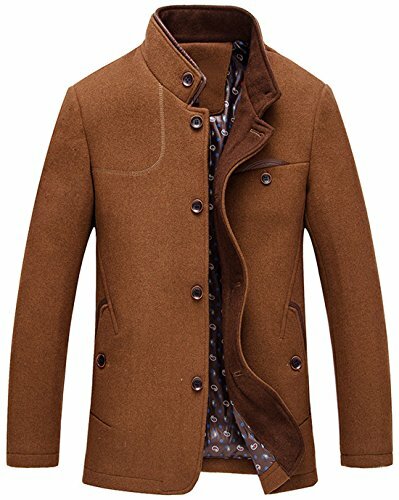 Warm Tips: After a long journey, there are always slight folds while receiving a new wool coat honestly. Hot ironed if needed (cover a towel). NOTICE: BOTH SIDE POCKETS ARE SEWN, but it is supposed to be this way for new. You just need to use a seam ripper to open sewn pockets. And we also plan to make the pockets open in next year. Washing Instructions: No machine wash, dry-cleaning. Do not dehydrate and wring out. It is recommended to dry in the air. ---According to the light and different computer monitor,the color may be slightly different as pictures. ---It'll be highly-appreciated for leaving a positive review if satisfied after receiving. ---Feel free to contact us if any questions before ordering and after-sale issues. 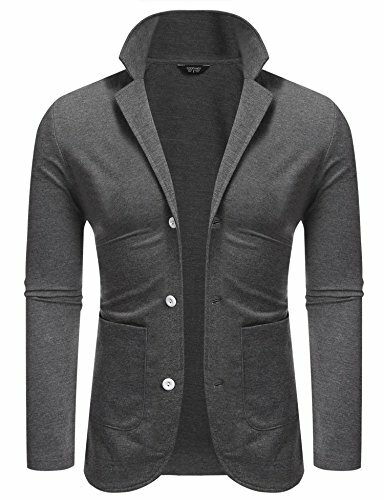 High Quality Men Awesome Vintage Stylish Cape Cardigan Loose Gothic Punk Casual Jacket . 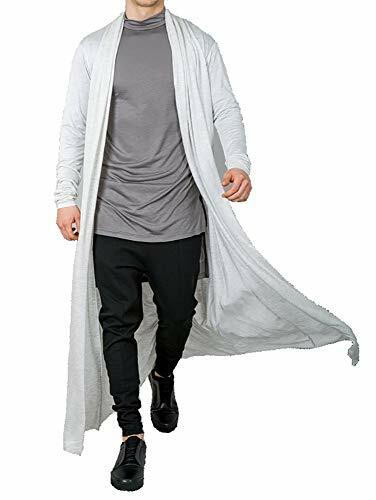 This cool easy-to-be-layered open long cardigan will add your style an unbeatable avant-garde edge and fashion touch. Great outfit for spring or fall days,works great with unlimited numbers of tops and bottoms . 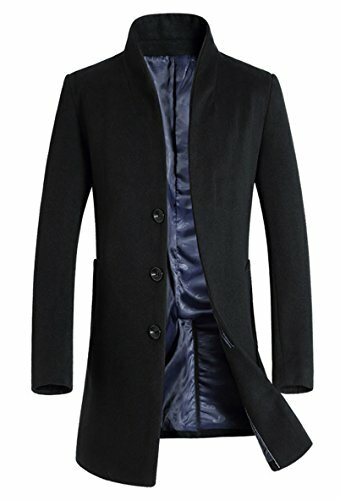 This trench jacket overcoat is made of great 50% wool and 50% polyester keeps warm and feel soft, various colors,various sizes. Slim fit,mid-long style with unique collar design and simple cuff, when button closer, make you a vintage gentleman. 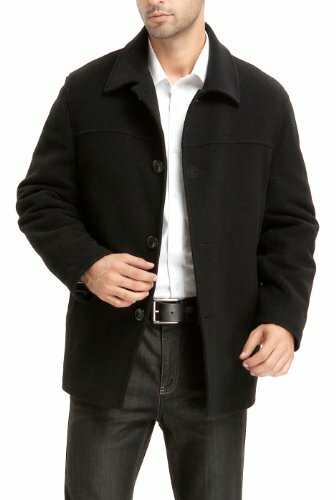 This wool coat is the first choice for your daily work and commercial activities as men's business suit for Fall, spring and winter, the pattern of it has always attracted people's attention. Size XS: Length:31.5" Bust:40.1" Shoulder:17.6" Sleeves:24.1"
Yunwn store is a professional manufacturer and retailer. We guarantee the style is the same as shown in the pictures. Please notice these features when you shopping on our store. 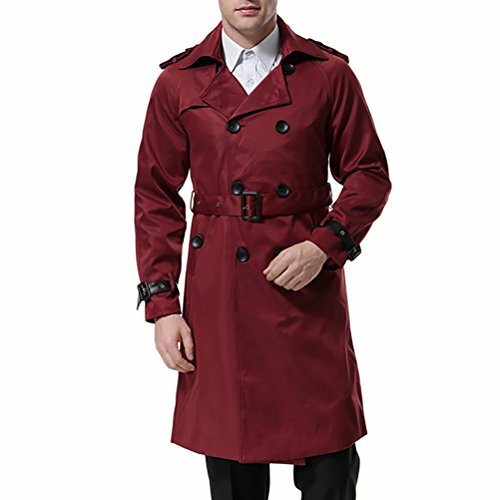 Double-breasted trench coat featuring shoulder epaulets,zip-out liner,and detachable collar. Belted waist and cuffs for adjustable fit. XS:Chest 98cm/38.6" Shoulder 43cm/16.9" Sleeve 61cm/24.0" Length 100cm/39.4"
S: Chest 102cm/40.2" Shoulder 45cm/17.7" Sleeve 62cm/24.4" Length 102cm/40.2"
M: Chest 106cm/41.7" Shoulder 47cm/18.5" Sleeve 64cm/25.2" Length 104cm/40.9"
L: Chest 110cm/43.3" Shoulder 49cm/19.3" Sleeve 65cm/25.6" Length 106cm/41.7"
Stylish outlook windbreaker overcoat, soft and comfortble wearing. 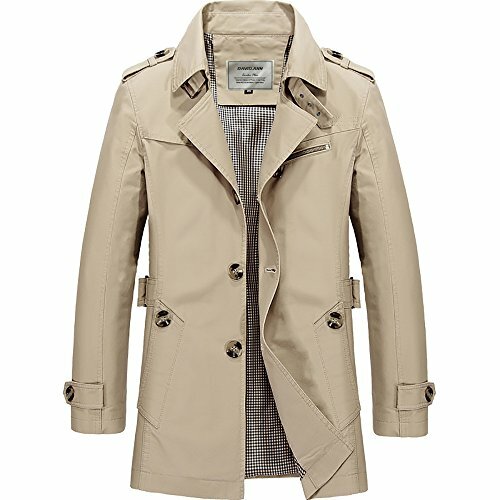 Tips: This trench coat slim fit type, a bit smaller than usual size, buy one size larger when you are buying. Size:M Bust:110cm/43.3" Shoulder:47cm/18.5" Sleeve Length:62cm/24.4" Length:70cm/27.6"
Size:L Bust:114cm/44.9" Shoulder:48cm/19.0" Sleeve Length:63.5cm/25.0" Length:73cm/28.7"
Size:XL Bust:118cm/46.5" Shoulder:49cm/19.3" Sleeve Length:65cm/25.6" Length:75cm/29.5"
Size:2XL Bust:122cm/48.0" Shoulder:50cm/19.7" Sleeve Length:66.5cm/26.2" Length:78cm/30.7"
Size:3XL Bust:126cm/49.6" Shoulder:51cm/20.1" Sleeve Length:68cm/26.8" Length:80cm/31.5"
Size:4XL Bust:130cm/51.2" Shoulder:53cm/20.9" Sleeve Length:69.5cm/27.4" Length:83cm/32.7"
Classic & luxurious velour smoking jacket made of premium cotton blend. A tie strap is used to wrap this elegant jacket around you. The cotton poly material is thick to keep you warm day & night. Perfect for hosting, smoking, lounging & all occasions. A True Luxurious Smoking Jacket Made of The Finest Fabric For The Sophisticated & Classy Gentleman. Gift Box & Travel Bag Included! 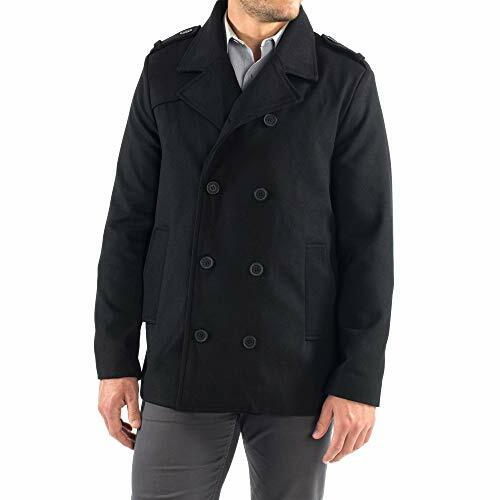 Jake Pea Coat By Alpine Swiss MSRP: $185.00 Look great and be warm. 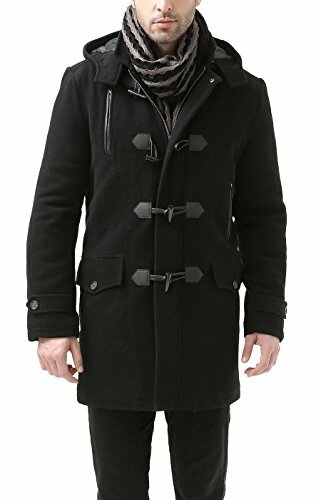 These are an incredible value if you are looking for a well made stylish coat which will not go out of style and keep you looking good and warm for years. THIS COAT IS FITTED IF YOU HAVE WIDER BACK OR BIGGER TRICEPS OR LATS WE RECOMMEND GOING WITH 1 SIZE LARGER Product Features: Light weight for slimming Fit Full Satin lining 31" Length for the size Medium 2 Full sized inside chest pockets 2 Outer pockets Snap shoulder epaulette Classic Pea Coat Style Wool blend outer 30/70 blend with polyester Alpine Swiss donates 2500 meals every day to hungry children in the U.S. and around the world through our partnership with Children's Hunger Fund. These meals are hand delivered in a Food Pack, which will contain enough food to feed a family of 4-5 for a week to the homes of the needy by trained volunteers in their community, establishing relationships that foster genuine care. Your purchase fuels this effort! Thank you! 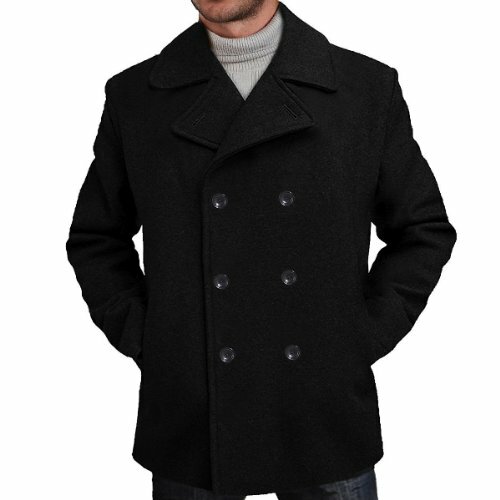 Classic pea coat styling including shoulder epaulette. Light weight for slimming fit. Casual and business decent with a narrow leg pants and shirts. Handsome and warm with scarf in the winter, especially red. Compared with puffer and down coat, it shows more stylish and slim. US S : Length - 31.89" Chest - 41.73" Shoulder- 18.50" Sleeve length - 25.20"
US M : Length - 32.28" Chest - 44.09" Shoulder- 19.09" Sleeve length - 25.59"
US L : Length -32.68" Chest - 46.46" Shoulder - 19.69" Sleeve length - 25.98"
US XL: Length - 33.07" Chest - 48.82" Shoulder- 20.28" Sleeve length - 26.38"
US XXL: Length - 33.46" Chest - 54.33" Shoulder- 22.83" Sleeve length - 28.74"
Hand wash with mid soap. Dry cleaning can avoid shrinkage. Do not scrub the coat. Lay it flat to dry out of direct sunlight. Set your washing machine to the gentle cycle with a lukewarm water temperature. Winter peacoat quilted padded lining and inner collar with elastic rib and hidden handwarmer rib cuff, keep you warm in cold weather. Wind shielding layer is great for windy days. Faux multi pockets, 2 chest pockets and 2 welt pockets and 2 inner pockets for keys, phone, wallet, cards, cash and other small items. 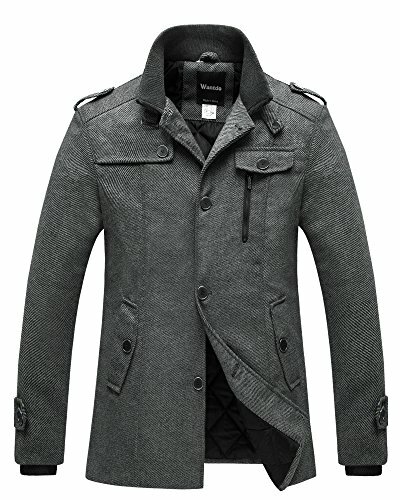 Military style overcoat, its durability and windproof outerwear, perfect for outdoors, work, school, patry. Cut from a soft fleece-style polyester fabric and double stand collar with collar strap, comfortable to wear in your daily life. 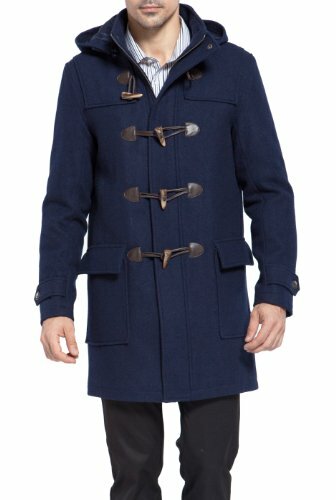 A refined wool blend is shaped into a classic duffle coat with a removable hood. Traditional toggle closures with leather loops, oversized patch pockets, button-tab cuffs, and single vent authenticate the design. Insulated polyester filling adds extra warmth for cold winter. 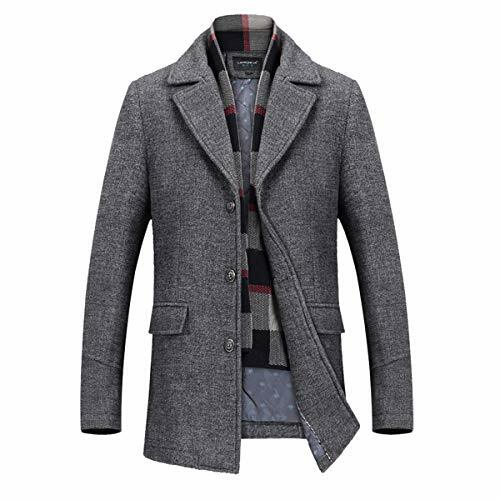 A warm, dashing duffle overcoat is crafted from a soft wool blend. The removable hood and toggle placket add classic details. Insulated polyester filling adds extra warmth for cold winter. 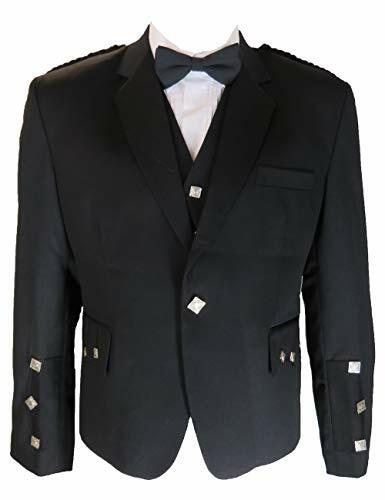 The Argyll from UT Kilts is the perfect formal jacket and vest for your special occasion. Whether it is a wedding or other black tie event, this amazing looking jacket will put your look above everyone else. From the quality craftsmanship to the stylish silver button accents, this jacket is absolutely stunning. The 5 button Argyll vest comes included with the jacket to finish off the entire outfit in style. There is only one thing this jacket and vest do not have: A high price! FOLLOW OUR SIZE GUIDE: Here at UT Kilts, we want you to choose the best-fitting jacket possible. Do not guess your size or order based on other jackets or sport coats you have purchased in the past. Using a cloth measuring tape, measure around your chest right at your arm pits. Order the size you measure. If you are in between sizes, we recommend going up a size. If you need a long or a short version, please contact us as we can custom order any size you need. QUALITY JACKET, LOW PRICE: Don't let anyone tell you that great quality can't come with a low price on a kilt jacket and vest. UT Kilts gives you amazing quality plus a lifetime warranty on all the metal buttons! You won't find a good jacket for this cheap anywhere else. It's a great investment for your Scottish clothes and accessories collection. 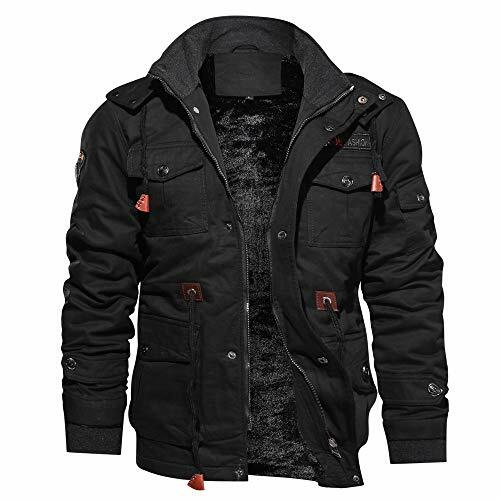 This jacket is simply perfect for teen boys and men looking for a unique outfit. UT KILTS: Each one of our jackets for sale has been designed with to give you the best look and fit possible. All our jackets are the highest quality. Whether you purchase the Prince Charlie, Argyll, or Modern Style, you can be sure it will last. Each jacket and vest uses high-quality materials. You can have peace of mind knowing that a jacket and vest from UT Kilts is built to go through whatever life can throw at it. JACKET AND VEST INCLUDED: Your jacket will come with a beautifully crafted, matching vest as well. Both are included in the amazing price listed. These do not come with the bow tie or the shirt. 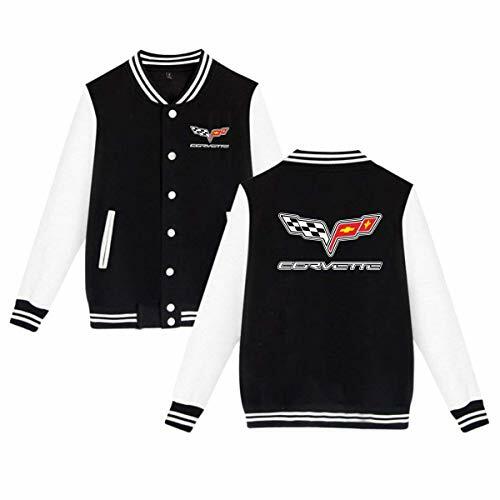 Classic Style Boys Girl Sport Baseball Uniform Jacket, Can Be Paired With Jeans, Sports Pants, Wei Pants, Shorts. Suitable To Spring, Autumn, Winter, Such As School, Concert, Sports And Outdoors. Material: CVC Brushed Cloth 20% Cotton 80% Polyester. Ribbed Stand Collar & Cuffs And Waistband With Stripe Details, Two Slash Front Pockets. Unisex Baseball Jacket, Matching With Sweatpants And Jeans. Baseball Jacket Uniform Gifts For Your Birthday Or Party,Casual Outfit,Party Night, Church, Photography,School, Outdoor,Daily Wear,Vocation. 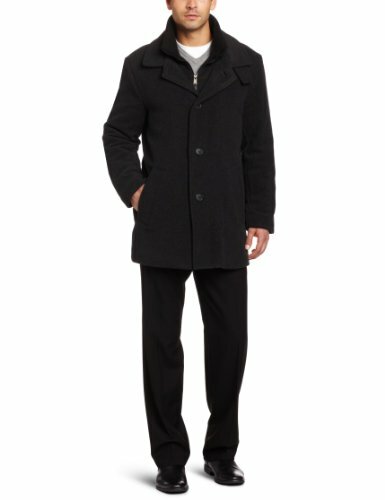 This sharp wool blended car coat, styled with a front yoke and four-button placket is a great everyday choice for you commute to work. Insulated polyester filling adds extra warmth for cold winter.